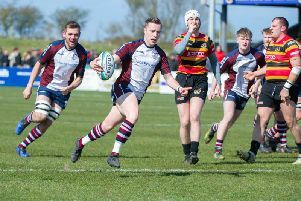 Scarborough RUFC slumped to a 34-13 loss at North One East title rivals Morpeth. Morpeth took the lead after 10 minutes with a penalty from their number 10, after Scarborough had been penalised for collapsing the scrum. The visitors levelled with a Tom Ratcliffe penalty six minutes later, Morpeth with an infringement at the breakdown in front of the posts. The home side regained the lead in the 22nd minute. At a scrum to Morpeth on the Scarborough 10-metre line, the home number nine broke away to go through a Scarborough tackle for a converted try to make it 10-3. Ten minutes into the second half a drop goal put the hosts 10 points clear, then on the hour mark Morpeth score a converted try to lead 20-3. Then more sloppy play from Scarborough caused a knock-on, from the resulting scrum Morpeth scored out wide and the try was converted once again as the hosts led 27-3. A crossfield kick from Ratcliffe then found Manning Smith out wide to touch down, the conversion was missed as they made it 27-8. Scarborough then gave away another penalty on their own try-line, Morpeth then drove over and a conversion put them 34-8 ahead on 71 minutes. The visitors soon replied with another try, Aaron Wilson crashing over after several drives after Scarborough had won possession, the conversion being missed and the score finishing 34-13.